Indian GP: Will the 2013 race be cancelled at the last minute? The cars have arrived at the Buddh International Circuit, the drivers are parading up and down clad in team uniforms, and personnel and busy preparing for Sunday's third Indian Grand Prix. However, there is a realistic chance that the race might not take place at all. The Supreme Court is set to hear a petition demanding the cancellation of the Indian Grand Prix on Friday. And if the court rules in favour of the petition, the third edition of the Indian GP could well be cancelled. The petition states that the organisers of the Indian Grand Prix, namely Jaypee Sports International Limited (JPSI), have failed to pay the entertainment tax that they were meant to pay after last year's edition of the race. Whether or not this is true hasn't been confirmed as yet. However, officials within JPSI have declared that they are willing to follow the court ruling. Meanwhile, from other quarters of the paddock, there is still the feeling that the race will go on unhindered. After all the cars and drivers are already here. Besides, this isn't the first time the Indian GP has been under threat of cancellation. However, we can't help but believe that underneath all of the petitions, there is nothing but a greasy palms vibe that lurks. Money will change hands, the race will go on as planned. At least we hope it does. It's bad enough that the Indian GP will take a year's hiatus from the F1 calendar in 2014. 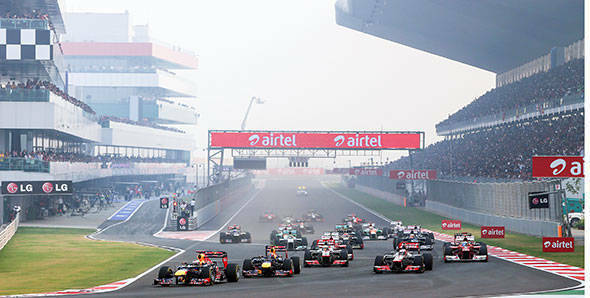 If they cancel the 2013 edition of the Grand Prix with two days to go, Formula 1 and India might never meet again. F1 has left the BIC, but will it return?